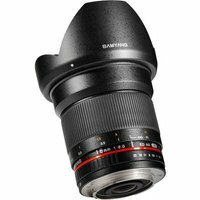 The Samyang 16mm f2 ED AS UMC CS is a wide-angle, manual focus lens with Canon M mount designed for use with the Canon EOS M compact system camera. The lens features multi-layer anti-reflective UMC coating which ensures very good transmission of light, whilst the ED (extra-low dispersion) glass reduces colour aberrations. The Samyang 16mm lens is ideal for taking landscapes, group shots, and shooting in low light thanks to its large f/2.0 aperture.